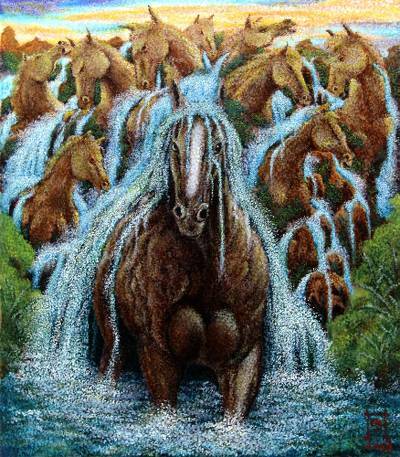 Signed Impressionist Surrealist Painting of Horses from Java, "Horse Cliff"
Against the orange glow of the sunset, an earthen cliff becomes the golden image of a team of horses with a waterfall that cascades over their heads. In the foreground, a proud stallion charges forward with water crashing over its head. Candra Gunawan paints this composition using a pointillist impressionist style, where careful dabs of the paintbrush seem to blend color and form.